Notes are a global function that let users enter additional notes for any master record like a customer, item, vendor or order record. Unlimited amounts of information can be entered for each master record. Notes can be used in conjunction with a note type and can be controlled with security, or even behave like a database. Notes can be specified to print on a particular document. Notes can also be grouped into folders or used as a knowledge base with search capabilities. Elliott provides a Graphical User Interface for Note functions, support of note folders, the ability to handle large amounts of notes, and knowledge base search capabilities. Ticklers are an extension to notes. 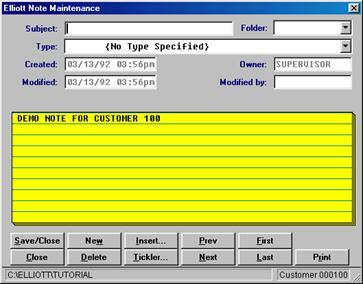 When you have a note in the system, you can designate the note as a tickler also. By designating a note as a tickler, you will be reminded on a certain date and time that a task/tickler is due. Ticklers are a standard feature in Elliott and there is an automatic reminder function where users will be alerted of the tickler at the pre-set remind date and time. In addition, the system separates the remind date/time from the due date/time. Also, ticklers can now be designated as a recurring tickler. Ticklers are not only useful as self-reminders, but also a very useful management tool. 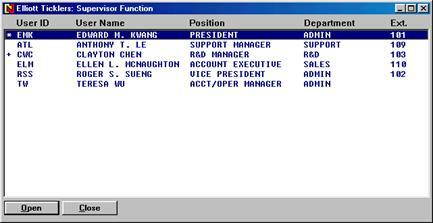 By setting up a company hierarchy structure in Elliott, supervisors will be allowed to view the ticklers of his/her subordinates. If a subordinate is a supervisor as well, further drill downs can be allowed. A supervisor can also assign a tickler (task) to a subordinate. The traditional list box user interface is used to highlight a note – arrow key up, down, or page up, page down. Use the mouse or use scroll bar when there’s more than one page of data. If the note has an “*” in front of the subject area this indicates that the note is a tickler. You may sort notes by any of the columns by clicking on the column heading. By default, they are sorted by the date/time sequence. Open: Open the note that is highlighted. Close: Close the note window and return to the application. Delete: Delete the current note that is highlighted. New: Create a new Note. Print: You can print either the highlighted notes or all the notes in the list box. Move: Move a note from one folder (or blank folder) to another folder. Filters: By default, all notes for the current reference (i.e. Customer 000100) will display in the list box. You may choose to narrow it down or expand it. For example, if you wish, you can see all notes for all customers in the list box. There is a limitation of 1,000 notes in the list box. You probably will need to use other criteria to narrow your list if your list exceeds 1,000 notes. Using Filters in conjunction with the “Search” function makes notes a powerful knowledge base tool. User Notes: User notes are a special kind of note. It refers to a note that is attached to the current user (instead of the current reference). 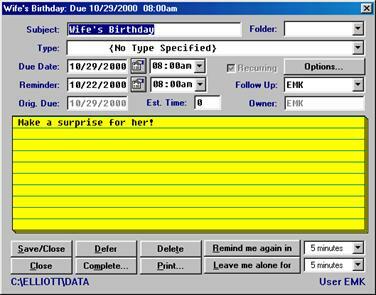 User notes are often used for tickler purposes. Exclude Ticklers: If this box is checked, then tickler notes won’t display in the list box. Exclude Folders: If this box is checked, then ticklers that have been moved to a folder will not display in the list box. Search/Clear: This is to search for a specific text string. For example, if you have hundreds of notes for a customer and you are trying to find the cellular phone number for one of the customer contacts, enter “Cell” as the search string and click on “Search.” The system will then only display notes for this customer that contain the text “Cell”. Using this tool in conjunction with the “Filter” function, you can search the entire note database for certain key words. Searching for multiple key words with an “And” condition is also allowed and makes the notes function not only a database, but also a knowledge base. By default, the notes will be sorted by ascending sequence based on the creation date. However, you may click on any column of the list box to instruct the system to sort the note by that column sequence. If you wish to sort the note by the descending sequence of a column, then simply use must to click on the heading of the column twice. Above is a sample note. This is a regular note without a note type. You can enter up to 10 lines with 60 characters per line of information. If additional information is needed, you can simply add another note and continue to enter more information. As long as each note in the same reference is one second apart, you can continue to add additional notes without any limitations. · Upper Case: Convert the entire line to upper case. Lower Case: Convert the entire line to lower case. Proper Case: Convert each word with a leading upper case for the entire line. Insert a line: Insert a blank line at the current position and push the other lines down by one line. This function will only work if the note type is blank or the note type does not contain any literals. Delete a line: Delete the current line and pull subsequent lines up by one line. This function will only work if the note type is blank or the note type does not contain any literals. Copy: Copy the content of current line. Paste: Paste the clipboard content to current line. Cancel: Abort all changes and exit the context menu. In some situations, further customization of notes may be necessary. This may be true if: (1) you want to make the notes like a database; (2) you want to add security to the notes; (3) you want to control printing characteristics. You may want to define the different note types in advance to accomplish such tasks. When setting up a note type, a specific field name (literal name) for each line in the note can be defined as shown below. When entering a note, you have the option to choose a note type. As a result, the note screen will display the name of the note type and the note will be saved as the specified type, making it similar to a database. This can be helpful in collecting information because the information will be entered in a fixed position and a report writer can be used to print this data. With Design Your Own Form (invoice, picking ticket, orders, etc. ), users can also print a specific line of the note on the form and make this an extension of the database. In the above example, a note type “CONTAC” is specified. The note content area displays the field name (literal name) for each line. This is a powerful extension to Elliott’s database, because any information that you wish to collect for a customer, vendor, item or order can be entered in a note working in conjunction with the note type. The Notes folder is intended to make notes more manageable. Consider this, you have hundreds of notes for a customer. Some of them need to be accessed frequently, but many of them are more or less historical information and probably can be set aside. Because there are hundreds of notes, it is difficult to find the note that you need to access frequently. One option to resolve the issue is to move the notes that are not needed frequently to a folder. Categorize your infrequently used notes by folder type. Leave those notes that are frequently used in the blank folder. Then, when you bring up a note, you can do one of two things: (1) Exclude notes in the folder by checking “Exclude Folders”; or (2) Sort by Folder by clicking on the “Folder” heading. This way you can quickly locate your note without navigating through hundreds of them. 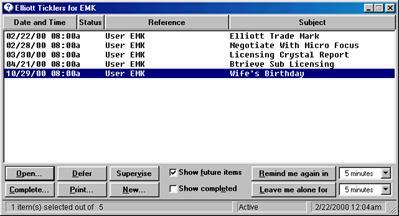 Tickler is a standard feature in V6.7 of Elliott. The previous tickler function, before V6.X.056, would require checking for ticklers by manually using the notes reporting function. With V6.X.056, Elliott warns you about ticklers that are due. The Audio effect is available only if user has a sound card and speakers with their system. The automatic tickler reminder can be started in one of two ways: (1) Launch the tickler reminder function when Elliott is started; (2) Launch the tickler reminder independently of Elliott. Ticklers are more than a to do list or a reminder, they are also a very powerful management tool. One of the steps required to set up ticklers is to define the organization’s hierarchy structure. Not only can supervisors assign tasks to themselves, they can also assign tasks to subordinates. Supervisors can also view and manage the tasks (ticklers) that have been assigned to subordinates. By fully implementing ticklers in your organization, you can better manage your company. The first step to setting up the tickler function is to go to “preference setup” (toolbar button) and indicate the directory where you want to scan for ticklers. Elliott supports the multi-company option, therefore you can have multiple notes and tickler databases in different directories. Chances are if a tickler becomes due in any one of the data directories, you want to know about it. The tab “Tickler” in the preference setup screen allows users to set up the directory where the note and tickler database resides. You can define up to 10 directories. 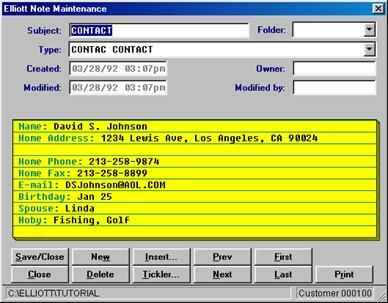 By default, it will use the DATA (Company 1) directory to look for tickler information. Even though the system will search multiple companies for the tickler information, only the first company’s users and hierarchy structure are used to determine the security information. The preference setup only affects the local workstation. Therefore, you should setup each workstation that will use the tickler function. The setup information is stored in the NSI.INI file in the C:\WINDOWS or C:\WINNT directory. 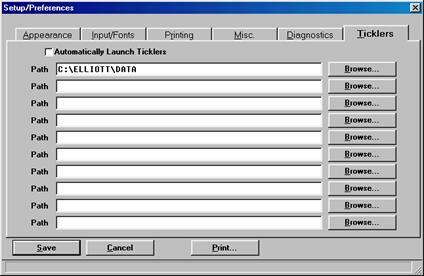 In the previous setup screen, if you check the box “Automatically Launch Tickler”, then the tickler reminder function will start automatically when Elliott is started. Once the tickler reminder is started, it will stay active even if you exit Elliiott. The only time it will be closed is if you shut down the system or manually close the tickler reminder by right clicking on the tickler icon in the task bar, usually on the bottom right of the screen. · Make sure passwords are turned on. To turn on passwords, go to Password setup and choose “Turn On Password”. · Make sure each potential user of the tickler function has been set up with a user name and password in the “Password Setup” function. · Go to the Main Menu, Util-Setup, System File Maintenance, Choose “User File”. Use the “Add” function to define all users’ full names, positions, departments and extensions. · Go to the Main Menu, Util-Setup, System File Maintenance, Choose “User Supervisor File”. Use the “Add” function to define the supervisor and subordinate relationship. You can define as many hierarchy levels as you like. Use the edit list to verify that the hierarchy structure is correct. The Elliott installation program installs the “Tickler” Icon in the “Elliott” group for the workstation where the installation program was run. On a network, this icon is not created for workstations. Note: Substitute with the proper drive letter and directory to match your installation. By clicking on this icon, the system will launch the tickler reminder function. This is the preferred method of starting the tickler, rather than the automatic method where ticklers launch automatically with Elliott. If you want to launch ticklers automatically when you start your computer, simply copy and paste the tickler icon to your “Start Up” folder. If the tickler is started before Elliott, the system will ask you to login with a user name and password. Then, if the ticker is still running when you start Elliott, the system will not prompt for a user name and password. Once the tickler is running, the tickler icon will appear on the right side of your task bar. This icon will stay there even if all your Elliott sessions are closed. This icon is the tickler monitor. It will scan all ticklers (once per minute) for the user and remind the user of any tasks when the remind date and time is due. It is suggested that you have a sound card and speakers so you can get the audio effect for reminders. If you wish to see the outstanding ticklers or add a new tickler, you can click on this icon and the user interface for the tickler function will display. You may manually remove the tickler monitor function by right clicking the icon on the right side of the task bar and choosing “Close”. Show Future Items: By default, this window will only show the past due (past remind date and time) items. However, you may also want to see the items that will be due in the future. In that case you can check this box. Show Completed: By default, this window will not show any items that are marked as completed. However, if you wish to see them, you can check this box. Sorting: By default, the items in the list box are sorted by the date/time field. You may click on any of the headings in the list box to sort the items by that field. Open: This will open the currently highlighted tickler and display the detail window. The hours field is for reference purposes and you may wish to add up the total hours you spent working on this task as a performance measurement tool. Defer: Defer instructs the tickler reminder “not to remind me” about this item for today (as long as the tickler reminder remains in memory without being closed). Print: This will allow you either to print the highlighted tickler or all the ticklers in the list box. Supervise: This button will only display if you are a supervisor. It allows you to drill down to subordinate’s ticklers to review their progress with their tasks. There is more information about this function later in the chapter. New: Click on this button to create a new tickler. A tickler is also a note. The new tickler that is created will be recorded as a user note. Remind Me Again in: When a tickler becomes due, you may not have time to deal with it at that moment. Using this option will allow you to tell the system to remind you again sometime in the future. You can ask the system to remind you at another time, in as little as 5 minutes or up to 1 year. This changes the remind date and time and does not affect your due date and time. Leave Me Alone for: When you start the tickler function, there may be a long list of ticklers that are due and waiting your attention. If you know you will be busy for a while and do not wish to be disturbed by the tickler reminders, you can choose “Leave Me Alone for” from 5 minutes to 4 hours. This will stop the tickler reminder function for that period of time. Once you decide that you need to enable the tickler checking again, you can click on the button at the same position for “Resume Tickler Checking”. Due Date/Time: This is the date and time when this tickler will become due. You may click on the icon beside the date field and a calendar will display to help you to identify the due date. In the calendar screen, the dates that are bold are either company holidays or your personal vacation days, as specified in the CALENDAR.CFG file. Reminder Date/Time: By default, the reminder date and time will be the same as the due date and time. However, you may choose to let the system remind you one week before the due date. Or you may choose to let the system to remind you 15 minutes prior to your appointment. The reminder date/time can be after the due date/time if you are behind with your tasks. Original Due: When you are behind with your tasks, you may choose to extend your due date and time. However, the original due date (the due date when tickler was first created) will not be changed even if you change your due date. You can’t change original date field. This serves as a performance measurement for how well you complete your tasks on time. You may choose the frequency with which you want the task to recur. Also, you may choose to be reminded again with advance notice of the due date. In the above example, the tickler will recur once a year. The reminder date will be 7 days before the due date. When you complete a recurring tickler, Elliott will mark that tickler as completed, and create a new tickler with the same content for the new recurring date. Est. Time: This is a reference field and is used to estimate how much time is required to complete this task. This can be used as a performance measurement tool. This is a list of users that you directly supervise. Users with a “+” symbol beside the user ID are also supervisors. When you click on this type of user, you will further drill down to the users they supervise. At the end, when you click on the final user, you will be able to see the tickler list window for that user. There is no limitation for how many levels you can drill down to. This is a useful function for seeing the outstanding tasks of your subordinates. It can be used to manage your department or your company. If you can ensure that all the tasks a user needs to complete are entered into the tickler, then this tool can be used to manage not only the tasks you assign to your subordinates, but it will also give you a good idea what your subordinate is working on. By understanding whether your subordinate prioritizes the tasks correctly, you can take necessary management actions to correct any potential problems. Supervisors can create ticklers and assign them to themselves or to their subordinates. Subordinates can create ticklers and assign them to themselves, but can not create a tickler and assign it to their supervisor. The user who created the tickler will have full rights to that tickler, including add, change, delete, complete, defer and any other actions that can be done with a tickler. 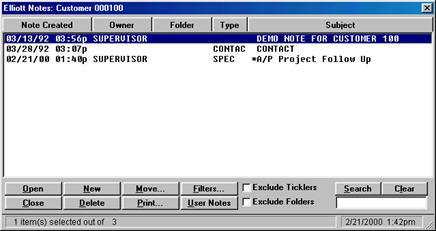 The user may or may not have full rights to the tickler that is assigned by his/her supervisor, depending on the note type. Previously in this chapter, we discussed that a note type can be used to control security by setting the flags for sharable read, change and delete. If the tickler does not have a note type, then there will be no security limitation to the user who has been assigned to the tickler. If the note type is defined and the note type specified is not shareable for read, change or delete, the user being assigned to the tickler will still have the minimum rights to read and complete the tickler. This is obvious, for the supervisor must intend to at least let the user read and complete that tickler when the tickler is assigned to that user. Supervisors always have full rights to the ticklers created by their subordinates. If necessary, supervisors can also reassign a tickler to another user that they supervise.